Take a full-day trip from Toronto to Niagara Falls (in Canada), with the freedom to go your own way when you get there. You'll be dropped at the foot of Clifton Hill, from where you can make your own way to the falls, shops and many attractions. Your visit to Niagara Falls includes a spectacular boat ride aboard Hornblower Niagara Cruises (weather conditions permitting). 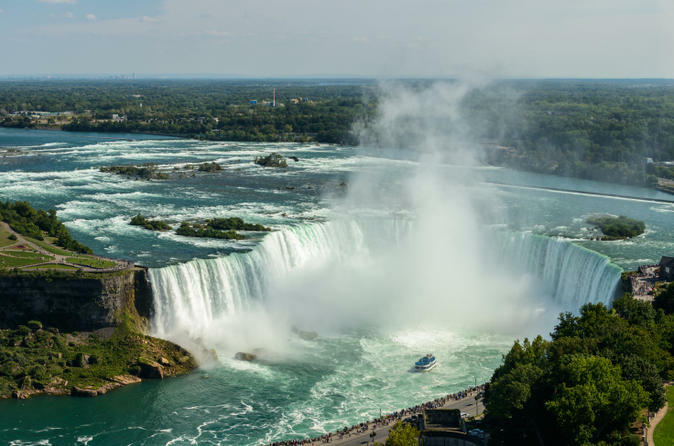 Your full-day tour from Toronto takes you in air-conditioned comfort through the breathtaking scenery of the orchard-laden Niagara Peninsula to Niagara Falls. You'll get to see as well as experience the grandeur beauty of the Niagara Falls from the Canadian side. Do your own thing at the falls for the afternoon (approx. 3 hours) but don't forget to take a ride on the Hornblower Niagara Cruises boat, included in the cost of the tour. If the boats aren't operating (end October to mid April depending on weather conditions), you can experience the spectacular presentation on the falls at the Imax Theater. Your freedom visit to Niagara Falls continues by coach to the stunning Whirlpool Rapids observation deck. You'll visit the Floral Clock, then travel through the picturesque historic community of Niagara-on-the-Lake. Your day trip to Niagara Falls from Toronto concludes with a stop at a local winery.